Architecturally speaking, ceilings and walls exist as functional pieces providing support and spatial definition in home and building design. However, ceilings and walls may also hold aesthetic value. Everything from paint to posters, light fixtures, crown molding and cornices add aesthetic value and presence to walls and ceilings. Determining whether you can use cornices in place of crown molding for ceilings requires looking at the meaning of each word and understanding how they relate to interior design. Crown molding often appears between wall and ceiling. Crown molding refers to any molding that "crowns" a surface. For instance, if a bookshelf or fireplace contains decorate molding that rises higher than the top of the body of the structure, this constitutes crown molding. As a generic term, crown molding can occur ultimately on any surface, with edges or decorative designs protruding higher than its top. Crown molding gets its name from the fact that it sits on top of something, in the same way that the crown of the head is on top. Cornice may refer to one of two things. In classical Greek architecture, a cornice constitutes part of the entablature, or the structural element between the columns and roof of a building. In modern interior design, cornice refers to a decorative element used as a transition between a wall and a ceiling. Such cornices assume a variety of forms, from simple designs consisting of nothing more than single painted wood boards to ornate carvings that create designs on the ceiling and walls of a room. The word may also denote a horizontal covering to hide curtain rods. 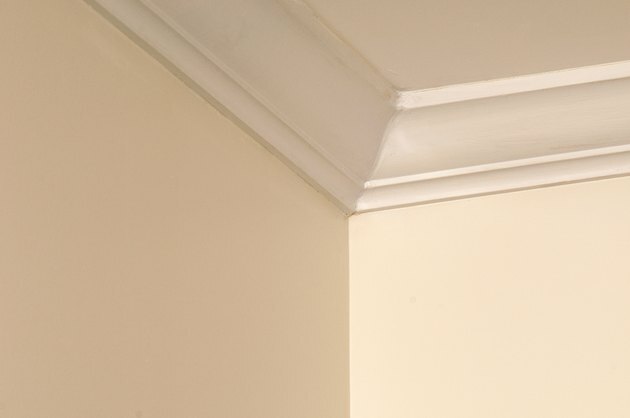 Modern cornices found in interior environments constitute a type of crown molding. Because it sits between the wall and ceiling of a room, a cornice technically crowns the wall, making it a form of crown molding. In some cases, the term cornice refers to ornate molding designs between a ceiling and a wall, while the term crown molding references more simplistic designs. Technically, however, the only differences between these terms lies in the fact that crown molding generically refers to all such molding. Interior spaces often use crown molding and cornices simultaneously. Technically speaking, you cannot use a cornice instead of a crown because they constitute the same thing. However, some interior design resources, such as the book "Interior Trim: Making, Installing and Finishing," recommend matching cornices to crown molding on bookshelves, fireplaces, cabinets and doorways to create an overall sense of aesthetic cohesion in a room. This may prove somewhat difficult with ornate cornices, requiring the assistance of a professional carpenter or contractor. What Is the Difference Between Visual Texture and Tactile Texture in Design? What Is the Difference Between Wainscoting and Beadboard? What Is a Fillet With Wood?